Friday 1 June is once again the day when the UK celebrates all that's good about our 'National' dish! Did you know that in Britain we eat over 380 million portions of fish and chips every year? So, for the millions who love our national dish, #NationalFishandChipDay is just one more excuse to celebrate with a plateful this Friday! If you are popping down to your local chippy, it's great to choose sustainable cod or haddock - in fact lots of chip shops across the country now proudly display the MSC 'blue tick' logo so that's one to watch out for. 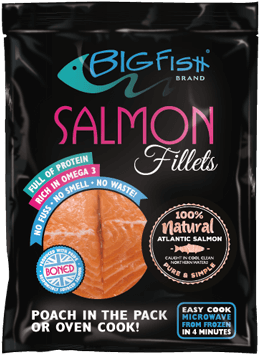 But of course, here at BigFish Brand we're all about salmon. Because we use top quality, sustainably sourced farmed salmon, there's no worry about overfishing and our fantastic fast salmon fillets really do make a great fish and chip supper, straight from the freezer at home! Plus of course salmon is rich in Omega-3, so salmon and chips is just that little bit healthier than traditional cod or haddock. Why not check out our Fast Fish & Chips recipe. And for everything you want to know about National Fish & Chip Day click here.